If you are storing anything in your basement that could potentially be damaged by damp or water, make sure it is sealed in an airtight container. If it is not too large, a plastic food storage box might be ideal. Buy a set of deep shelves and several cheap baskets that fit well. These are ideal for sorting small items and helping you to find what you need in the basement. Cycles can be stored in basements if the access is easy – why not fix bike hooks on to the wall to hang them on to save space? Ensure your basement is not damp before you store anything down there that might be damaged. Have your circuits inspected to ensure they are safe and check your basement lighting regularly to ensure it works when you need to find something quickly. Put a shoe rack or boot box close to the access in the basement to store wellies and muddy shoes. Large, plastic boxes with lids, from DIY stores or on-line sources – make good basement storage. Some will even stack or have drawers. If you do get a build up of humidity, try using a dehumidifier to remove moisture from the air. Check your basement regularly to make sure you don’t have rodent or pest infestations that might damage your stored items and grow worse over time. 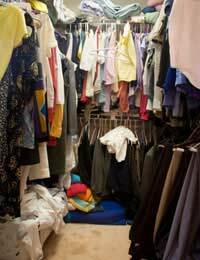 While a basement can be the perfect place to hide clutter do not fall into the temptation of just filling it with junk. Have a “kiddy corner” in your basement for the storage of your children’s play equipment such as beach and outdoor toys, or items like play houses, that may have to be taken down and stored away from time to time. Check your basement regularly for leaks and floods, especially if there has been a bout of bad weather. You do not want any of your items to suffer from water damage. Mark or label every box, drawer or storage container so you know exactly what is in it. Keep your basement neat and tidy at all times to make it easier to organise and to access your stored items. This can work well in a basement because it will allow the air to circulate and will stand up to water damage better than wood. Some open metal shelving can also be reconfigured as your storage needs change. Poor ventilation in a basement will result in excess moisture and could cause mould to grow on your belongings. Check there is some fresh air. Many people set up an area from which they can quickly grab things they know they might need. This might be a special cupboard for the storage of extra food-stuffs, such as tins, or toilet rolls - or it might be the space under the stairs where you keep the broom or vacuum handy so you can grab them quickly. Fit rails in the basement and hang clothes and coats down there, under covers, during the seasons you are not wearing them. If your basement is not damp, have sockets fitted near tool storage areas so you can check items work before carrying them up and, if need be, use the area as a workshop. A basement is a great place to store tools. Organise them into one corner so you can find them easily and ensure anything dangerous is either under lock and key or out of reach of children. To maximise the use of storage space under your basement stairs, fit specially-sized graduating shelves. Try to store things right up the walls of your basement. Fit shelving to make the most of vertical as well as horizontal space and to help you organise. A basement can be the perfect place to store wine. Find a corner away from any light or possible heat sources and set up a wine rack. Make yourself have a “Basement Day” once a year, where you spend a few hours sorting and clearing out the basement, and reorganising storage. Store z-beds, roll up futons and spare mattresses in your basement ready to bring up when you have lots of overnight guests. This gives you more day-to-day space in the main body of the house.